Diagrams of Power showcases art and design works using data, diagrams, maps and visualizations as ways of challenging dominant narratives and supporting the resilience of marginalized communities. Diagrams of Power showcases art and design works using data, diagrams, maps and visualizations as ways of challenging dominant narratives and supporting the resilience of marginalized communities. The exhibition brochure is available online here. Joshua Akers is an Assistant Professor of Geography and Urban and Regional Studies at the University of Michigan-Dearborn. He is the founder and director of the Urban Praxis Workshop and member of the Property Praxis Research Collective. Akers’ research and writing examines the intersection of markets and policy and their material impacts on everyday life. This work has appeared in Environment and Planning A, Geoforum, International Journal of Urban and Regional Research, Urban Geography, Derive and Guernica. Erin McElroy is the cofounder of the Anti-Eviction Mapping Project and the activist-based peer-reviewed Radical Housing Journal. She is a doctoral candidate in Feminist Studies at the University of California, Santa Cruz, focusing on techno imaginaries and postsocialist Romania and Silicon Valley. The Anti-Eviction Mapping Project is a data visualization, data analysis, and digital storytelling collective documenting dispossession and resistance upon gentrifying US landscapes. Josh Begley is a data artist and app developer based in Brooklyn, New York. Begley is the director of two short films, Best of Luck with the Wall (2016) and Concussion Protocol (2018). His work has appeared in The New Yorker, The New York Times, The Atlantic, The Guardian, New York Magazine, the Whitney, the Met Breuer, the Museum of Modern Art, and the New Museum of Contemporary Art. Joseph Beuys (12 May 1921 – 23 January 1986) was a German Fluxus, happening, and performance artist as well as a sculptor, installation artist, graphic artist, art theorist, and pedagogue. His extensive work is grounded in concepts of humanism, social philosophy and anthroposophy; it culminates in his "extended definition of art" and the idea of social sculpture as a gesamtkunstwerk, for which he claimed a creative, participatory role in shaping society and politics. He is widely regarded as one of the most influential artists of the second half of the 20th century. Vincent Brown is the Charles Warren Professor of History and Professor of African and African American Studies and Director of the History Design Studio at Harvard University. He is a multi-media historian with a keen interest in the political implications of cultural practice. Brown is the author of The Reaper's Garden: Death and Power in the World of Atlantic Slavery (Harvard University Press, 2008) and producer of an audiovisual documentary about the anthropologist Melville J. Herskovits broadcast on the PBS series Independent Lens. He is currently writing a book about African diasporic warfare in the Americas. Bureau d’études is an artist collective that lives and works in Saint Menoux, France. For 15 years, the group has developed research on the structures of power and capitalism. The group is currently working on a collective project on agriculture, commons and resymbolizing research: www.fermedelamhotte.fr. The Department of Unusual Certainties' objective is to use thoughtful, research-driven design to inspire engagement and dialogue. They practice the tradition of pragmatism, strategically applying design in the physical world to affect the social good. In 2010, Department of Unusual Certainties started as a result of a shared need to ask questions about our everyday existence. This curiosity continues to grow and has manifested over the years through projects that traverse urban design, public art, education, cartography and social engagement. Scholar and activist W.E.B. Du Bois was born on February 23, 1868, in Great Barrington, Massachusetts. In 1895, he became the first African American to earn a Ph.D. from Harvard University. Du Bois wrote extensively and was the best-known spokesperson for African-American rights during the first half of the 20th century. He co-founded the National Association for the Advancement of Colored People (N.A.A.C.P.) in 1909. Du Bois died in Ghana in 1963. Teddy Cruz is a professor of Public Culture and Urbanization in the Department of Visual Arts at the University of California, San Diego, and Director of Urban Research in the UCSD Center on Global Justice. Fonna Forman is a professor of Political Theory and Founding Director of the Center on Global Justice at the University of California, San Diego. Cruz + Forman are principals in Estudio Teddy Cruz + Fonna Forman, a research-based political and architectural practice in San Diego. Blurring conventional boundaries between theory and practice, and transgressing the fields of architecture and urbanism, political theory and urban policy, visual arts and public culture, Cruz + Forman lead a variety of urban research agendas and civic/public interventions in the San Diego-Tijuana border region and beyond. They will represent the United States in the 2018 Venice Architectural Biennale. Forensic Architecture is a research agency based at Goldsmiths, University of London, consisting of architects, artists, filmmakers, journalists, software developers, scientists, lawyers, and an extended network of collaborators from a wide variety of fields and disciplines. 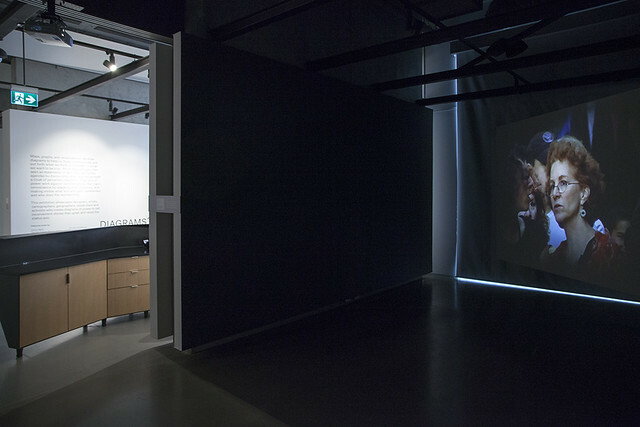 Founded in 2010 by Eyal Weizman, Forensic Architecture is committed to the development and dissemination of new evidentiary techniques. It undertakes advanced architectural and media investigations on behalf of international prosecutors, human rights and civil society groups, as well as political and environmental justice organisations, including Amnesty International, Human Rights Watch, B’tselem, Bureau of Investigative Journalism, and the UN, among others. Formed in 2006, Iconoclasistas is Pablo Ares and Julia Risler. Their projects combine graphic art, creative workshops and community-based research. Their works are offered online through Creative Commons licenses allowing free distribution and encouraging the creation of derivative works. Through the use of graphic devices and the design of several tools, Iconoclasistas fosters critical reflection that supports resistance and transformation. In the age of globalization, Julie Mehretu has created a new form of history painting whose themes include identity, cultural history, geography, and personal narrative. Born in Addis Ababa, Ethiopia, raised in East Lansing, Michigan, educated in Rhode Island and Senegal, and she resides in New York City and Berlin. Her life experience is reflected in her visual vocabulary, which is drawn from maps, urban-planning grids, and architectural forms. These are combined to make dynamic, delicate paintings, drawings, and prints that blur the line between abstraction and figuration. Mehretu’s art embodies the interconnected and complex character of the world. Lize Mogel is an interdisciplinary artist and counter-cartographer. Her work intersects the fields of popular education, cultural production, public policy, and mapping. She creates maps and mappings that produce new understandings of social and political issues. She has mapped public parks in Los Angeles; future territorial disputes in the Arctic; and wastewater economies in New York City. She is co-editor of the book/map collection "An Atlas of Radical Cartography,” a project that significantly influenced the conversation and production around mapping and activism. Ogimaa Mikana is an artist collective founded by Susan Blight (Anishinaabe, Couchiching) and Hayden King (Anishinaabe, Gchi’mnissing) in January 2013. Through public art, site-specific intervention, and social practice, Ogimaa Mikana asserts Anishinaabe self-determination on the land and in the public sphere. Margaret Pearce is a cartographer and writer based in Rockland, Maine. Since 2006, she has dedicated herself to exploring and developing the expressive capacities of cartographic language to represent human experience and dialogues across cultures to decolonize narratives and empower silenced voices. Pearce has eighteen years of experience teaching cartographic design, map history and Indigenous geographies at the university level, most recently as Associate Professor of Geography at University of Kansas. She is enrolled Citizen Potawatomi Nation, and former president of the North American Cartographic Information Society. Laura Poitras is a filmmaker, journalist and artist. CITIZENFOUR, the third installment of her post-9/11 Trilogy, won an Academy Award for Best Documentary, along with awards from the British Film Academy, Independent Spirit Awards, Director’s Guild of America and others. She recently presented a series of immersive installations and new work for her solo exhibition, ASTRO NOISE (2016), at the Whitney Museum of American Art. Her reporting on NSA mass surveillance based on Edward Snowden’s disclosures won the George Polk Award for national security journalism, and shared in the 2014 Pulitzer Prize for Public Service. She is on the board of the Freedom of the Press Foundation, and is co-creator of the visual journalism project Field of Vision. Philippe Rekacewicz is a French geographer, cartographer and information designer and associate researcher at the University of Helsinki. With Philippe Rivière, he developed visionscarto.net, a research website dedicated to “radical and experimental cartography and geography.” Rekacewicz follows issues such as demography, refugees and displaced persons, and migration and statelessness persons. He has worked on a number of projects bringing together cartography, art and politics, especially studying how communities and political or economic powers produce the cartographic vision of the territories on which they operate, and how they can manipulate those maps. Visualizing Impact is a laboratory for innovation at the intersection of data science, technology, and design. Visualizing Impact creates impactful tools highlighting critical social issues around the world. Diagrams of Power is produced with the support of the Canada Council for the Arts, OCAD University's Office of the Faculty of Design, Public Visualization Lab, Nexus Investments, Multi Touch Digital and Microsoft. Diagram of Power's public workshops and research engagement events is supported by the Social Sciences and Humanities Research Council of Canada. Onsite Gallery gratefully acknowledges that the new gallery construction project is funded in part by the Government of Canada's Canada Cultural Spaces Fund at Canadian Heritage, the City of Toronto through a Section 37 agreement and Aspen Ridge Homes; with gallery furniture by Nienkämper. Onsite Gallery logo by Dean Martin Design. Image: Forensic Architecture, The Ayotzinapa Case: A Cartography of Violence (still), 2017. Video, 18 min. 24 sec.